Friday, December 14: The WordPress Weekly Photo Challenge is delicate. IN A NEW POST CREATED SPECIFICALLY FOR THIS CHALLENGE, SHARE A PICTURE THAT MEANS DELICATE TO YOU. Delicate could be the tracings of frost on a window, a child’s tiny fingers and toes, the intricate pattern of a tree’s canopy, or something yet-to-be-discovered. So much of this challenge depends on your interpretation of “delicate,” and we look forward to seeing the range of images you capture. A fond farewell to Crete…. Tuesday, September 4: I return to Rethymno for my last evening in Crete. 😦 After having a Mythos beer at Cafe Galano, soaking up the atmosphere and watching the stylish Europeans stroll past, I use the internet upstairs. I return to Barbara Studios to take a shower and a little nap, and then head back into the streets again to wander and have some dinner. I pass a cute little church with some Orthodox priests talking outside. I take a picture of the church but I feel taking a picture of the priests is an intrusion, so I don’t. Monday, September 3: I drive back to Rethymno from Hania and on the way in, I pass by an adorable little church right along the sea. Across the street I find some colorful graffiti on a wall. 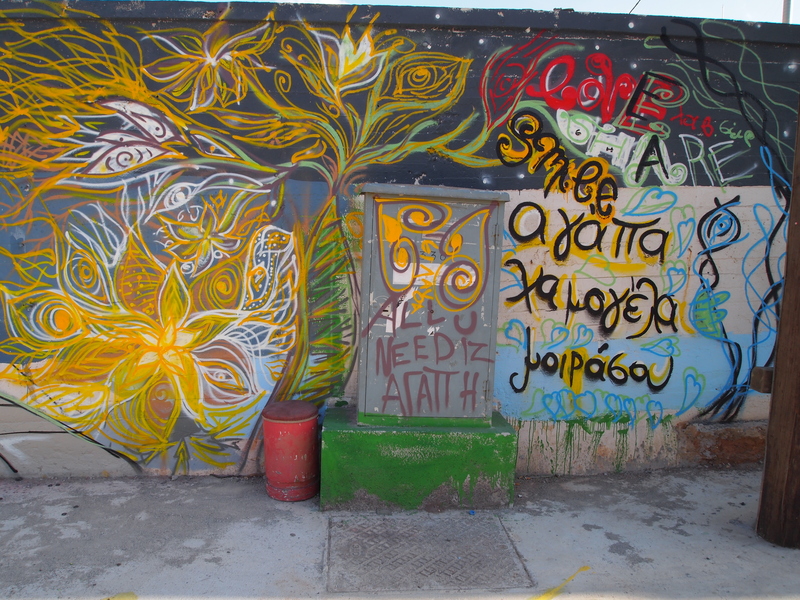 Obviously the street artists are not confined to Athens. After stopping at this place to take some photos, I park my car again by the Fort and meander back through the town. I head directly to Cafe Galero, where I order my first Mythos beer in Greece. Cafe Galero is a huge cafe in the center of the old town of Rethymno. Large groups seem to congregate here. The cafe also has an internet cafe upstairs, which I use after I relax and enjoy people-watching. I catch up on my emails and Facebook. Monday, September 3: After walking along the Mediterranean, where I see a lone fisherman standing on a rock and an older lady swimming off another set of rocks, I climb the steep hill to Rethymno Fortress. The Fortezza is the 16th century Venetian fortress, almost in the center of the old town. The giant Fortezza is visible from every corner of the town and offers panoramic views of Rethymno and the coast to the west, according to Explore Crete. Rethymno became a city because the Venetians, who were a marine power, created it as an intermediate station between Heraklion and Hania. At that time, the city needed protection from the Turks, so they organized Crete’s military and built a fort. The foundation stone was laid on 8 April 1540 but the walls were only completed just before 1570. Monday, September 3: The sleeping at Barbara Studios is lovely, with a breeze billowing the curtains into the room and the chirping of birds in the courtyard. I want to sleep in, but since I only have two days in Crete, I make myself get up and take a shower. There is a little kitchenette in the hotel, a coffee-maker and toaster, bread and jam and orange juice in the refrigerator. I shower, prepare the little breakfast, and think about what I will do with the day ahead.